Heartsaver First Aid, CPR AED is a classroom, video-based, instructor-led course from the American Heart Association that teaches students critical skills needed to respond to and manage a variety of emergencies such as first aid, choking, heart attacks, and cardiac arrest within the first few minutes of occurring until more advanced emergency medical services can arrive. Students learn various skills like how to treat allergic reactions, bleeding control, sprains, broken bones, shock and along with other first aid emergencies. In addition, this course teaches Adult, Child, Infant CPR and AED use. AUDIENCE: This course is for anyone with limited or no formal medical training who needs a course completion card in first aid, CPR and AED in order to meet certain job, regulatory, or other requirements. The US Coast Guard (USCG) as approved the AHA Heartsaver First Aid CPR AED course as meeting the USCG Elementary First Aid Training requirements (see USCG Requirements below). This course is NOT for Healthcare Providers, see our Basic Life Support CPR course. COURSE FORMAT: This course is classroom-based which includes instructor, video, and skills interaction throughout the course. The course is approximately 8 hours in length. 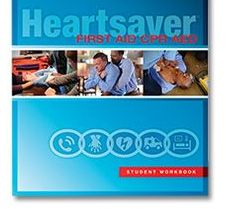 CERTIFICATION: Upon completion of this course, students receive an American Heart Association Heartsaver First Aid, CPR AED Course completion card that is valid for two years. USCG requirements are AHA Instructor will provide a certificate to any maritime personnel that requires the certificate to accompany their Heartsaver First Aid CPR AED course completion card upon successful completion of the course with all options completed and written exam.